Despite its inauspicious beginnings, Carmel Winery has now cornered about 40% of Israel’s contemporary wine market, producing internationally recognized wines. 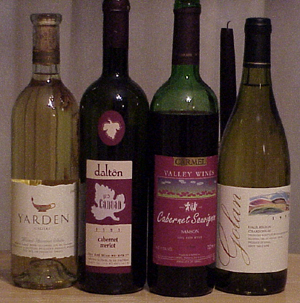 The 1990s marked a “true technological revolution” in Israeli wineries, with 90 percent of all current wineries founded during or after that time. Today, there are about 300 wineries in Israel, totaling about 15,000 acres of land and producing about 40 million bottles of wine. Robert Parker, among the world’s most influential wine critics, has lauded Israel’s wine industry, rating some 40 Israeli wines. Fourteen of them won more than 90 out of a maximum 100 points in Parker’s rating system. As successful as Israel’s wine industry has become, the Israeli beer market is also setting firm roots in the Jewish state. As an article in The Jerusalem Post magazine points out, “The rumor is that after the wine revolution, the land of milk and honey is now undergoing a beer awakening.” Though mainstream Tempo Beer Industries (producer of well-known Goldstar and Maccabee) Israel Beer Breweries (who brew Carlsberg and Tuborg) hold about 70 percent of the Israeli beer market, smaller beer distributors and boutique breweries are heeding the call for increased demand in beer, particularly premium beers. Though small microbreweries only hold about 1 percent of the market with just ten microbreweries, beer consultant Gad Deviri hypothesizes that like “the experience of the American craft beer market [Israel] can see that it is in the first stage of the revolution, diversion from mainstream commercial brands to craft beers.” Winemakers are also following this trend, with 250 commercial mini wineries opening over the last decade. So, instead of the usual Manischewitz, you can spice up your next Shabbat dinner, Kiddush, or social gathering with an Israeli wine or beer, such as a selection from the award winning Golan Heights winery or the popular, non-alcoholic “Black” Nesher Malt, which is the first beer commercially produced in Israel. Such a choice is kosher, both literally and figuratively, so bottoms up and l’chaim! Interesting. I’ll have to try an Israeli wine next time. Great article and links! Thank you. Makes Me Want to Schedule Immediate Visit to the World of Wines. This writer has done it again. Another well-researched, insightful and entertaining article. Where did she get her literary talent? Now if only I liked wine. As someone who does not care for wine (I am a beer lover) I am gratified to learn that the Israeli beer industry is also making strides. Great article! Another well- researched and well-written article by Ms. Rosenthal. I plan to suggest to our local wine and spirits shop they consider adding Israeli wine and beer to one of the monthly gatherings they host for introducing new wines and beer. Nice to read good news about Israel for a change. Great article! I wouldn’t expect less of the Israelis.